April is Poetry Month and The Latina Book Club is celebrating with exciting and powerful poets that make us sit up and read and imagine. Hence, we have chosen a book of the month that makes us do all that. OCELOCIHUATL by Xánath Caraza brings a lump to your throat, a tear to your eye and a sigh to your heart. It’s a beautiful, haunting bilingual poetry collection written in vibrant imagery about a Jaguar woman – a spirit guide, if you will – that prowls and growls at the land, at society, at herself. 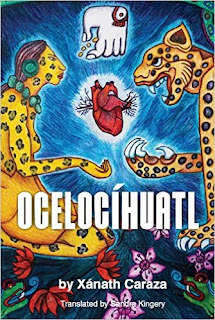 Ocelocíhuatl straddles two worlds and struggles to unite those worlds and make a place for herself. But violence, pain and suffering – like the 43 missing Mexican students and the slain teen Michael Brown – make her sad, angry, and frustrated. So the Jaguar Woman roams across different lands, eager to heal, desperate for peace.